Looking for a reliable web hosting service and/or Internet access provider in Canada? Here are a few companies that Provenance web magazine volunteer staff, editors and affilates have used over the years to some satisfaction. This section is to acknowledge the quality of personalized and prompt service provided by Brandy and Paige [in picture on right] as well as Jason, the technical support specialist for this section during this past 2 years. 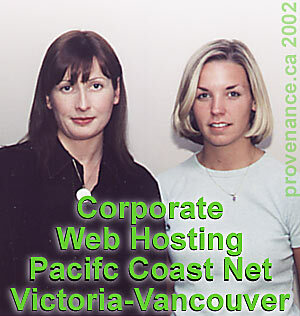 PacificCoast.net acquired one of Provenance's original corporate sponsors BC1.com around 1998 and while no longer a sponsor of this magazine, we would like to mention that the Corporate Accounts Section have worked long and hard at providing "solutions" for a number of other businesses and non-profit societies which I am involved with. With its headquarters in Victoria, B.C. Pacific Coast Net International Inc. is part of the "consolidation" of Internet Services in western Canada, with services in Victoria, Vancouver, Calgary and other locations in British Columbia and Alberta. Uniserve.com This company acquired Internet Gateway Corp. www.intergate.ca and continues to provide reliable dialup and hosting services to its former Internet Gateway customers. Internet Gateway Corp. was the first. corporate sponsor of Provenance back in 1995, we take this opportunity to again thank William and Paul for their generous support over the years. When we began to work with Intergate.ca it was about to open its services with its first 20 plus US Robotics modems, prior to being sold to Uniserve, Internet Gateway had over 40,000 customer-subscribers and offices in Vancouver and Toronto, as well as affiliated services in California. AOL some of our freelance writers have been using America Online services for some time, in part because of its convenience when travelling around the world.